Gold has been correcting sharply this week owing to two main reasons: first, the economic situation seems to have lifted tremendously from days of yesteryear. Europe is pretty much well contained, at least for now while USA is growing albeit slightly and China has rebounded strongly from its slump towards the end of last year. Political uncertainty worldwide has also decreased. Secondly, comments from the Fed yesterday indicated that the current unlimited stimulus could be withdrawn soon given how the outlook has improved again. What is still uncertain is that the Fed committee is still at odds with when is the appropriate time to remove it. 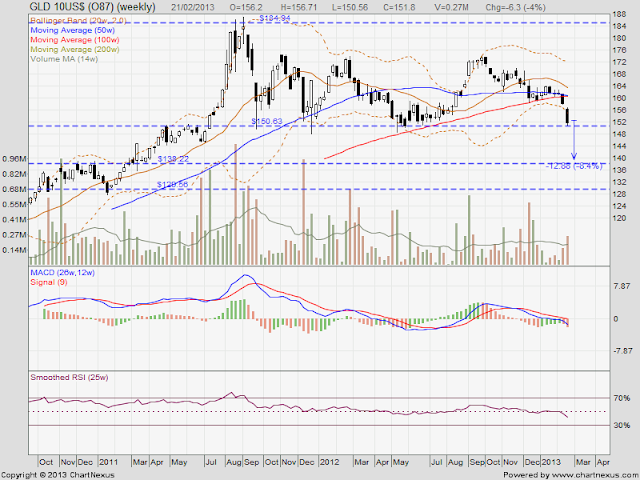 Nonetheless, with lesser stimulus, expect commodity prices to fall on a whole and hence gold will not be spared too. Large back solid candlestick this week bringing prices down to a major support level at US$150. MACD - has turned negative and diverging downwards. Short TP - $140 (8% from current levels) expected in 3-5 weeks. With the current outlook, it seems like gold prices should break support and head further south on the jittery Fed minutes that was recently disclosed. With more market opportunities elsewhere, it is easy to understand why this out flow of money has just begun.